Alex Cox (left) and Dominic DiLuzio as they arrived at Wonderland Station on Aug. 18, 2017. On Friday, the duo learned that they set a Guinness world record for visiting every T station on every subway line. Boston has continued its reign as the city of champions. 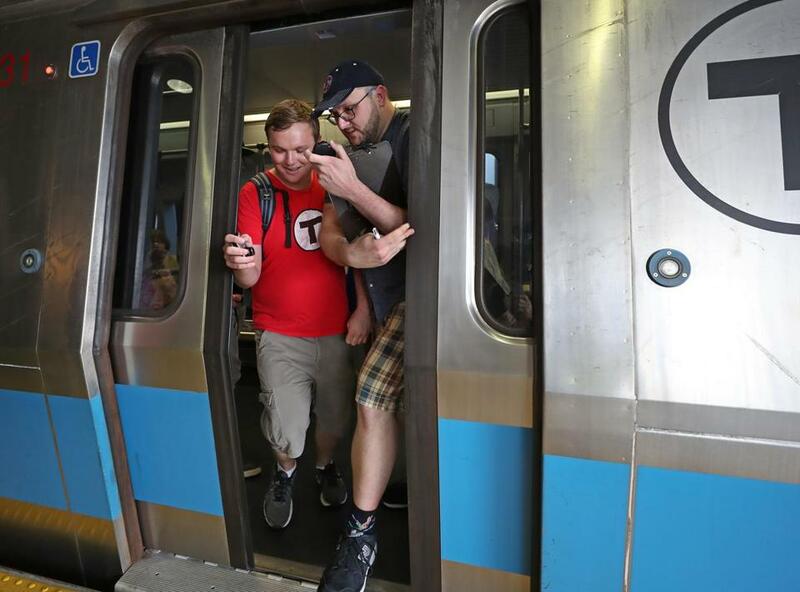 Alex Cox and Dominic DiLuzio, two transit enthusiasts who in 2017 spent 7 hours, 29 minutes, and 46 seconds traveling around on every MBTA subway line as quickly as possible to set a new world record, got word Friday that they had successfully completed the ambitious task. At 8:31 a.m., DiLuzio was riding the elevator on his way to work when he opened his e-mail and began flipping through his inbox. There, among the other messages he’d received, was a note from officials at Guinness World Records. It was the latter, he said, breathing a sigh of relief. The official title achieved is for “Fastest time to travel to all Boston subway stations,” with a time of 7:29:46, according to Guinness. DiLuzio and Cox will receive a certificate that includes details about their title and their addition to Guinness’s database. DiLuzio first came up with the plan to attempt a world record several years ago. Then, in 2017, after enlisting Cox, the pair started mapping and plotting their way across the sprawling transit system, before eventually gathering needed supplies and hopping on the subway on a hot August day. DiLuzio and Cox started their journey at 5:30 a.m. on a Friday, starting with the Red Line. The trip then took them on the Mattapan Trolley, onto a portion of the Orange Line, and then the Green Line’s many branches. After traveling the last leg of the Orange Line, they switched trains to take on the Blue Line and capped off the trek at Wonderland Station. Although the pair was certain they had accomplished the goal, they still needed to submit photos, videos, and other documents to Guinness proving they didn’t cut any corners. DiLuzio said that phase of the process has been ongoing for more than a year. But DiLuzio and Cox don’t have to fret about that anymore. “Being able to say ‘I hold the Guinness World Record for fastest time to ride to every MBTA station,’ without any caveats, is such an incredible feeling,” Cox said in a message to the Globe. Officials from the MBTA on Friday gave praise to the two ambitious commuters, who put the city’s aging transit agency in the record books. While achieving the title took a lot of time and effort, Cox said he would do it again in a heartbeat — he’s even looking over route plans for a second attempt, in case they have to defend their record once the Green Line Extension opens.